Finding and presenting good data is just a good first step. Medical marketers have to go beyond that to tell a story that connects with consumers. 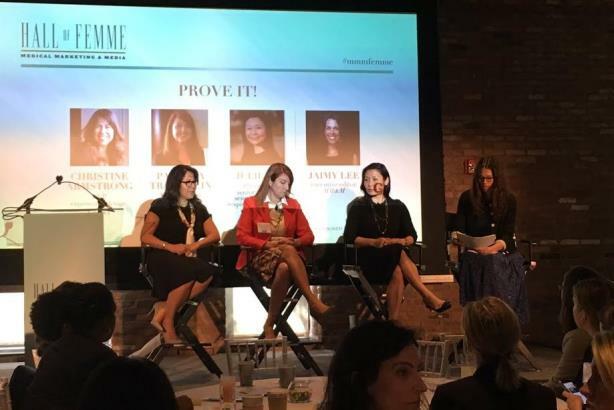 NEW YORK: Top women in medical marketing discussed the importance of finding and presenting good data and using a human connection with that data to reach the right audience at the inaugural Medical Marketing & Media Hall of Femme event in New York on Thursday. The panel, sponsored by Giant Creative Strategy, brought together three female marketing executives to talk about how they use data, as well as how being a woman affects their work. The group was comprised of Christine Armstrong, EVP of experience design at Giant Creative Strategy; Patricia Trautwein, VP of marketing and product management at Cochlear Americas; and Julie Vu, senior medical science director at respiratory franchise Genentech. The key to proving data’s worth is, first, nailing down exactly what it being measured, Trautwein said. "There are a lot of these buzzwords, like ‘engagement,’ and they’re hard to measure," she said. "We’re going to have to think about this as new technologies and new ways of interacting with customers come out. We’re going to have to figure out ways to measure those activities and their return." The priority should then be speaking the right language and telling the right story, whether it’s selling a medicine to doctors or pitching an idea to an executive. "Data is so powerful," Armstrong said. "Starting with the data story gives you an open field to tell that story in any way." Trautwein added: "Data initiates an emotion. When I come to a data person, I get them to talk about how they feel about the data to start a conversation." Vu’s perspective from the medical corporation side was slightly different. She worried that data can be a crutch for the industry. "In the world of medical, we have to have data to support everything," Vu said. "We latch onto that marketing research data, and we don’t go into uncharted territory and take risks and move forward." The panelists also discussed how women in the industry can use data to their advantage. The ability to pair it with a story or a human emotion is often easier for women, Trautwein contended. "You need to understand what good data looks like, but that doesn’t tell people what it means," Trautwein said. "Your human touch on that data will help people understand what it means." Armstrong said women often have a closer connection to the needs of the patient, simply because the majority of healthcare consumers are women. "Look at the statistics on women as caregivers; we are a data point in ourselves, and we have to harness that," Armstrong said. "We’re often the ones closest to caregiving at the [meeting] table. There's data to support voicing the women's perspective at the table."